Arachnophobia by MB&F is an eye-catching eight-legged sculpture that is both a table clock and a wall clock, and was created to mark the special 10th year anniversary celebrations of this avant-garde watch brand. The year 2015 had marked the tenth year anniversary of hyper-creativity from MB&F, the renowned maker of critically acclaimed Horological Machines and Legacy Machines. Founder Maximillian Büsser resigned from his position at Harry Winston to build an artistic and micro-engineering lab dedicated to working with talented horological professionals to design and craft radical concept watches that are stunning to behold. 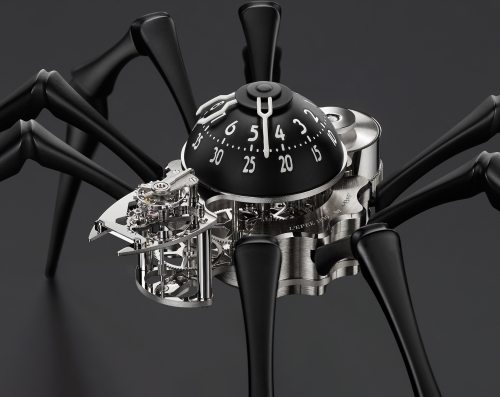 Now, the Geneva-based lab stuns with Arachnophobia, a visually powerful clock that’s as extreme as they come. Arachnophobia is both a table clock and a wall clock. Arachnophobia by MB&F is a three-dimensional sculpture that is beautifully engineered to be both a table clock and a wall clock. Crafted by L’Epée 1839, the only specialized high-end clock manufacturer in Switzerland, Arachnophobia was inspired by a giant spider sculpture, Maman, by Louise Bourgeois. The sculpture has been installed around the world, and now MB&F has combined it with precision clock movement. The timepiece by MB&F is sleek and efficient. Arachnophobia has a black dome with white numerals. The spider’s abdomen houses more than 218 components that make up the mechanical processes, with the head holding the regulator and its oscillating balance wheel and the back holding the mainspring barrel required for movement. The finely-finished, highly-visible movement has an impressive power reserve of eight days. 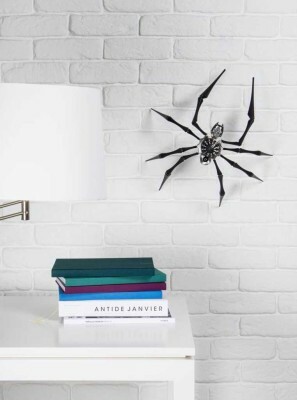 The modern looking timepiece is connected to eight articulated legs that can be rotated to make Arachnophobia stand tall as a desk display or splay flat on the wall. The legs can also be positioned with the front legs forward while the other six remain in standing position to make it seem as if the timepiece is actually moving. 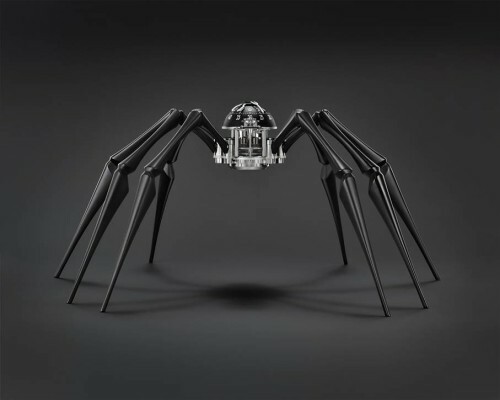 Arachnophobia by MB&F is 405 mm in diameter when the legs are fully extended. 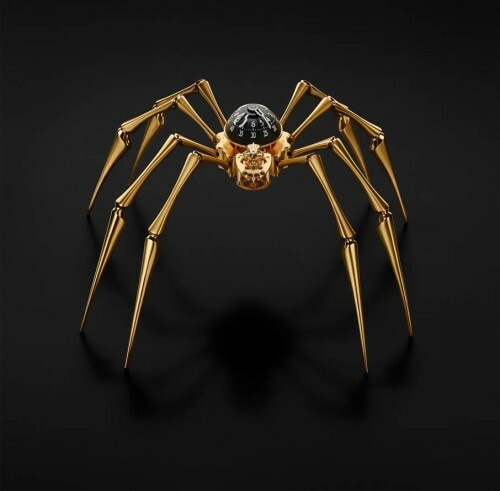 Arachnophobia comes in a realistic-looking lacquered black or a more artistic yellow gold. Master finishers carefully grind, polish, and cover each of the legs, paying careful attention to make them look realistic. Depending on your feeling about creepy-crawlies, it may be a bit unnerving to the owner when they will have to interact with the clock by winding the underside of the spider to set the time on the precision instrument. For more on Arachnophobia by MB&F, please click here. Tagged Art, Big Boys' Toys, Gadgets, LifeSpice, Luxurious watches. Bookmark the permalink.